Pumpkin, pumpkin and more pumpkin. Yes please! 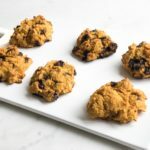 This time, delicious pumpkin chocolate chip cookies. In short, I’m in heaven. These cookies, like most of the others I make are super easy, and delicious. I’m also trying really hard to cut back on sugar that I use in recipes, so this one is a low sugar option too (always a good idea!). So I want to share this with you JUST in time for Halloween! Mix together the pancake mix, water, pumpkin and cinnamon- until smooth. Fold into the mixture the chocolate chips. Spray your baking pan with avocado oil- like this. Make cookies as big as you like (I used a full heaping Tbsp of the batter for each). Place the tray into the oven and bake for 15 minutes (maybe a few more). Remove the pan from the oven, allow to cool- or dive right in and enjoy!